Serving in Tunis 1952--Surrounded by Uncreated Light. "Sanctity is not simply virtuousness. It is the attainment of such a spiritual height that the abundance of God's grace, filling the saint, overflows on those who associate with him. Great is the blessedness of saints in which they dwell contemplating the glory of God. Full of love for God and man, they are responsive to man's needs, interceding before God and helping those who turn to them." Characterizing the ancient Saints with such words Vladika John simultaneously summarized also his own spiritual aspiration which made him one of the greatest Saints of our time. 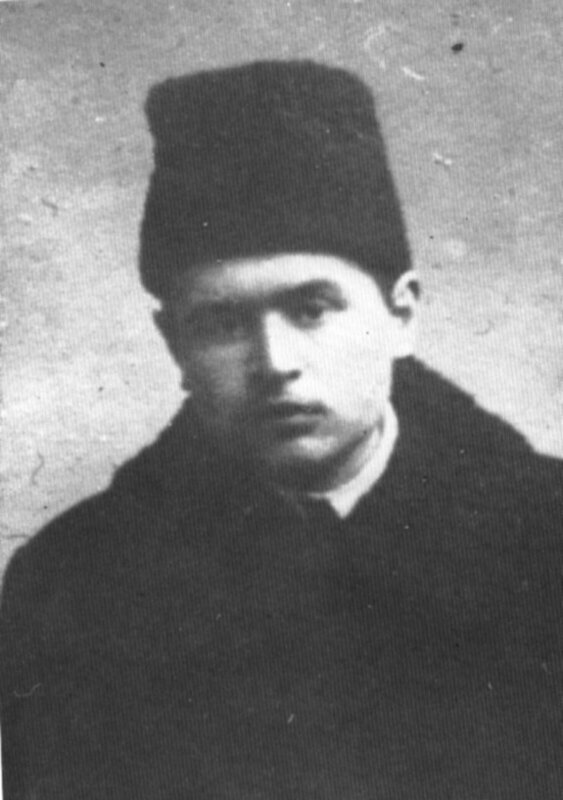 Misha Maximovitch, the future Archbishop John at age 15. 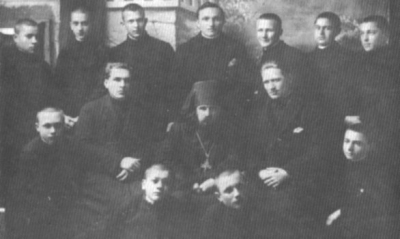 Hieromonk John (center) with Carpatho-Russian students at the Bitol Seminary, 1931. In 1924 Vladika was ordained reader in the Russian church in Belgrade by Metropolitan Anthony, who continued to exert great influence over him; and Vladika in his turn showed the utmost respect and devotion to his superior. 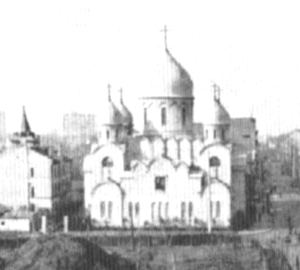 In 1926 Metropolitan Anthony tonsured him a monk and ordained him hierodeacon in the Milkov Monastery, giving him the name John, after Vladika's own distant relative, Saint John (Maximovitch) of Tobolsk. On November 21 of the same year Vladika was ordained hieromonk. The city of Bitol was in the diocese of Okhrida. At that time the ruling bishop of this diocese was Nicholas Velimirovich - a noted preacher, poet, writer, and insirer of the popular religious movement. He, as much as Metropolitan Anthony, valued and loved the young Hieromonk John, and himself exerted a beneficial influence upon him. More than once he was heard to say, "If you wish to see a living saint, go to Bitol to Father John." For, indeed, it began to become evident that this was an entirely extraordinary man. It was his own students who first discovered what was perhaps Vladika's greatest feat of asceticism. They noticed at first that he stayed up long after everyone else had gone to bed; he would go through the dormitories at night and pick up blankets that had fallen down and cover the unsuspecting sleepers, making the Sign of the Cross over them. Finally it was discovered that he scarcely slept at all, and never in a bed, allowing himself only an hour or two each night of uncomfortable rest in a sitting position, or bent over on the floor praying before icons. Years afterward he himself admitted that since taking the monastic vows he had not slept lying in a bed. Such an ascetic practice is a very rare one; and yet it is not unknown to Orthodox tradition. 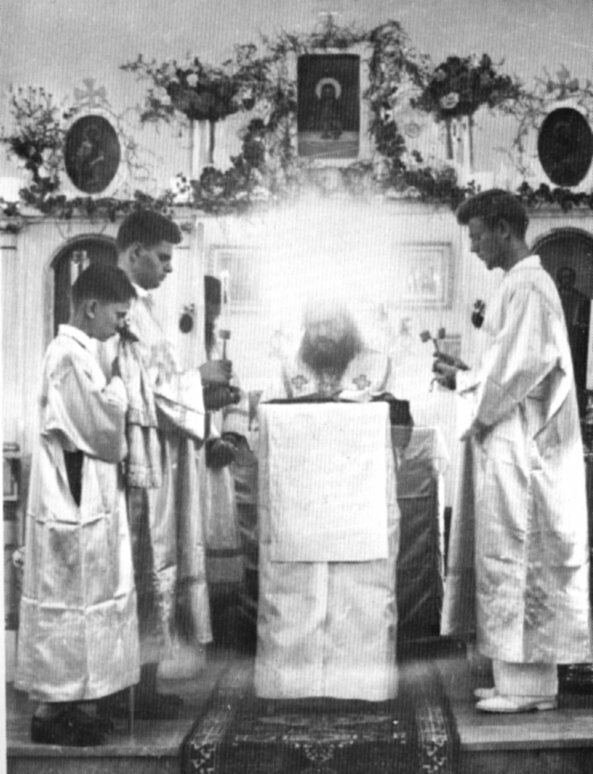 The consecration occurred on May 28, 1934. Vladika was the last bishop of the very many to be consecrated by Metropolitan Anthony, and the extraordinarily high esteem in which that venerable hierarch held the new bishop is indicated in a letter which he sent to Archbishop Dimitry in the Far East. Himself declining an invitation to retire to China, he wrote: "Dear friend! I am very old and unable to travel ... But in place of myself, as my soul, as my heart, I am sending you Bishop John. This little, frail man, looking almost like a child, is in actuality a miracle of ascetic firmness and strictness in our time of total spiritual enfeeblement." Vladika was assigned to the Diocese of Shanghai, China. The Shanghai Cathedral, built under the direction of Bishop John in the 1930's. VLADIKA ARRIVED IN SHANGHAI in late November, on the Feast of the Entrance of the Mother of God into the Temple, and found a large cathedral uncompleted and a jurisdictional conflict to resolve. The first thing he did was to restore Church unity. He established contact with Serbs, Greeks, Ukrainians. He paid special attention to religious education and made it a rule to be present at the oral examinations of the catechism classes in all the Orthodox schools in Shanghai. He at once became a protector of various charitable and philanthropic societies and actively participated in their work, especially after seeing the needy circumstances in which the majority of his flock, refugees from the Soviet Union, were placed. He never went visiting for tea to the rich, but he was to be seen wherever there was need, regardless of times and weather. He organized a home for orphans and the children of needy parents, entrusting it to the heavenly protection of a Saint he highly venerated, St. Tikhon of Zadonsk, who loved children. Vladika himself gathered sick and starving children off the streets and dark alleys of Shanghai's slums. Beginning with eight children, the orphanage later housed up to a hundred children at one time, and some 1500 in all. When the Communists came, Vladika evacuated the whole orphanage, first to an island in the Philippines, and then to America. It soon became apparent to his new flock that Vladika was a great ascetic. The core of his asceticism was prayer and fasting. He ate once a day at 11 p.m. During the first and last weeks of Lent he did not eat at all, and for the rest of this and the Christmas fast he ate only bread from the altar. His nights he spent usually in prayer, and when he finally became exhausted he would put his head on the floor and steal a few hours of sleep near dawn. When the time would come to serve Matins, someone would knock on the door, to no avail; they would open the door and find Vladika huddled on the floor in the icon-corner, overcome by sleep. At a tap on the shoulder he would jump up, and in a few minutes he would be in church for services - cold water streaming down his beard, but quite awake. Vladika officiated in the cathedral every morning and evening, even when sick. He celebrated the Divine Liturgy daily, as he was to do for the rest of his life, and if for some reason he could not serve, he would still receive Holy Communion. No matter where he was, he would not miss a service. Once, according to a witness, "Vladika's leg was terribly swollen and the concilium of doctors, fearing gangrene, prescribed immediate hospitalization, which Vladika categorically refused. Then the Russian doctors informed the Parish Council that they released themselves of any responsibility for the health and even the life of the patient. The members of the Parish Council, after long pleas for mercy and threats of taking him by force, compelled Vladika to agree, and he was sent to the Russian Hospital in the morning of the day before the Feast of the Exaltation of the Holy Cross. By six o'clock, however, Vladika came limping to the cathedral on foot and served. In a day all the swelling was gone." Vladika's constant attention to self-mortification had its root in the fear of God, which he possessed in the tradition of the ancient Church and of Holy Russia. The following incident, told by 0. Skopichenko and confirmed by many from Shanghai, well illustrates his daring, unshakable faith in Christ. "Mrs. Menshikova was bitten by a mad dog. The injections against rabies she either refused to take or took carelessly ... And then she came down with this terrible disease. Bishop John found out about it and came to the dying woman. He gave her Holy Communion, but just then she began having one of the fits of this disease; she began to foam at the mouth, and at the same time she spit out the Holy Gifts which she had just received. The Holy Sacrament cannot be thrown out. And Vladika picked up and put in his mouth the Holy Gifts vomited by the sick woman. Those who were with him exclaimed: `Vladika, what are you doing! Rabies is terribly contagious!' But Vladika peacefully answered: `Nothing will happen; these are the Holy Gifts.' And indeed nothing did happen." By now it had become known that Vladika not only was a righteous man and an ascetic, but was also so close to God that he was endowed with the gift of clairvoyance and there were healings by his prayers. A striking account told by an eyewitness, Lidia Liu, testifies to Vladika's spiritual height. "Vladika came to Hong Kong twice. It's strange, but I, not knowing Vladika then, wrote him a letter asking him to help a widow with children, and I also asked him about some personal spiritual matter, but I never received an answer. A year passed. Vladika came to Hong Kong and I was in a crowd that went to meet him in church. Vladika turned to me and said, `It is you who wrote me the letter!' I was astonished, since Vladika had never seen me before." "A moleben was sung, after which Vladika, standing before a lectern, was delivering a sermon. I was standing next to my mother, and we both saw a light surrounding Vladika down to the lectern - a radiance around him a foot wide. This lasted a rather long time. When the sermon was over, I, struck by such an unusual phenomenon, told what we had seen to our friend, who replied to us: `Yes, many faithful saw it.' My husband, who was standing a little way off, also saw this light." A similar event occurred in 1939, when certain parishioner began to lose her faith due to many tribulations which had befallen her. Once, upon entering the Church during Vladika's service, she witnessed during the transubstantiation of the Holy Sacraments a little flame in the form of a large tulip descended into the Chalice. After this miracle her faith returned, and she began repenting of her faint-heartedness. Vladika visited prisons and celebrated the Divine Liturgy for the convicts. On one occasion in Shanghai, Vladika John was asked to give communion to a dying man in a Russian hospital. This time he took another priest with him. On his arrival he spotted a gregarious young man in his twenties, playing a harmonica. This lad was to be discharged the next day. Vladika John called to him and said: "I want to give you communion right now." The young man immediately confessed his sins and received communion. The astonished priest asked Vladika why he did not go to the one dying, but tarried instead with an obviously healthy young man. Vladika answered: "He will die tonight, and the other, who is seriously ill, will live many years." It happened just as he foretold. Vladika loved to visit the sick and did it every single day, hearing confessions and giving Holy Communion. If the condition of a patient should become critical, Vladika would go to him at any hour of the day or night to pray at his bedside. Here is one undoubted miracle among the many worked by Vladika's prayers; it was recorded and placed in the archives of the County Hospital in Shanghai. Vladika visited the prison also, and celebrated the Divine Liturgy for the convicts on a primitive little table. But the most difficult task for a pastor is to visit the mentally ill and the possessed - and Vladika sharply distinguished between the two. Outside Shanghai there was a mental hospital, and Vladika alone had the spiritual power to visit these terribly sick people. He gave them Holy Communion, and they, surprisingly, received it peacefully and listened to him. They always looked forward to his visits and met him with joy. In Shanghai, a voice teacher, Anna Petrovna Lushnikova, taught Vladika the proper method of breathing and pronunciation of words, thus helping him to better his diction. At the end of each lesson Vladika paid her 20 dollars. In 1945, during the war, she was gravely wounded and chanced to be in a French hospital. On a very stormy night, feeling that she might die, Anna Petrovna began asking the nurses to call Vladika John, who was in France, so that he would give her communion. The nurses refused since the hospital was locked up during the night due to war-time conditions. Anna Petrovna was beside herself and kept calling upon Vladika. Suddenly, around eleven o'clock in the evening, Vladika appeared in the ward. Unable to believe her eyes, Anna Petrovna asked Vladika, weather this was a dream or did he really come to her. Vladika smiled, prayed and administered communion to her. Following this she calmed down and slept. The next morning she felt cured. No one believed Anna Petrovna that Vladika visited her that night since the hospital was tightly secured. However, her ward neighbor substantiated the fact that she also saw Vladika. The greatest surprise was that under Anna Petrovna's pillow was found a 20 dollar bill. Thus Vladika left a material evidence of his visit. A former Shanghai altar boy of Vladika's and presently Archpriest George Larin, relates: "Notwithstanding Vladika's strictness, all the altar boys loved him very much. To me, Vladika was an ideal whom I wished to emulate in every way. Thus, during Lent, I stopped sleeping in bed and lay on the floor, I stopped eating the usual meals with the family, but partook of bread and water in solitude ... My parents became worried and took me to Vladika. Hearing them out, the prelate asked the guard to go to the store and bring a sausage. To my tearful outcries to the fact that I did not wish to break Lent, the wise prelate admonished me to eat the sausage and to remember always that obedience to parents is more important than personal accomplishments. "How then shall I go on Vladika?' - I asked wishing albeit to "especially" apply myself. - "Go to Church as you always did, and at home do what your mother and father ask.' I remember how grieved I was then that Vladika did not assign to me some "special' deeds." With the coming of the Communists, the Russians in China were forced once again to flee, most of them through the Philippine Islands. In 1949 approximately 5000 refugees from the Chinese mainland were living in an International Refugee Organization camp on the island of Tubabao in the Philippines. This island is located in the path of the seasonal typhoons which sweep through that part of the Pacific. During the 27-month period of the camp' s occupancy, the island was threatened only once by a typhoon, and it changed course and bypassed the island. When the fear of typhoons was mentioned by one Russian to the Filipinos, they replied that there was no reason to worry, because "your holy man blesses your camp from four directions every night." They referred to Vladika John; for no typhoon struck the island while he was there. After the camp had been almost totally evacuated and the people resettled elsewhere (mainly in the USA and Australia), it was struck by a terrible typhoon that totally destroyed the camp. 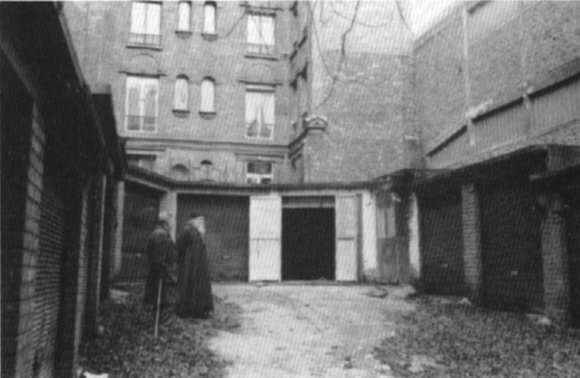 Archbishop John's Paris "Cathedral," actually a garage church, in the 1950's. Before it stands Fr. Mitrophan, a disciple of Archbishop John. VLADIKA HIMSELF went to Washington, D. C., to get his people to America. Legislation was changed and almost the whole camp came to the New World - thanks again to Vladika. The exodus of his flock from China accomplished, Archbishop John was given in 1951 a new field for his pastoral endeavor: he was sent by the Synod of Bishops to the Archdiocese of Western Europe, with his see first in Paris, and later in Brussels. He was now one of the leading hierarchs of the Russian Church, and his attendance was frequently required at the sessions of the Synod in New York City. In Western Europe Vladika took a deep interest not only in the Russians in the Diaspora, for whom he exerted himself tirelessly in labors similar to those for which he had been known in Shanghai, but also in the local inhabitants. He received under his jurisdiction local Dutch and French Orthodox Churches, protecting them and encouraging their Orthodox development. He celebrated the Divine Liturgy in Dutch and French, as before he had served in Greek and Chinese, and as later he was to serve in English. 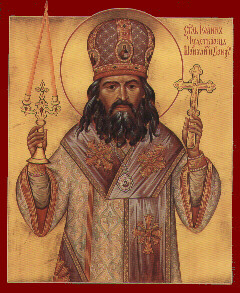 Vladika's interest in and devotion to the Church's Saints, of whom his knowledge was already seemingly limitless, was extended now to Western European Saints dating from before the schism of the Latin Church, many of whom, venerated only locally, were included in no Orthodox calendar of Saints. He collected their lives and images of them, and later submitted a long list of them to the Synod. From this period of Vladika's presence in Western Europe, Mrs. E. G. Chertkova reminisces: "On several occasions I visited Vladika when he lived in the Cadet Corps building near Paris. He had a small cell on the top floor. In the cell were a table, an armchair and several chairs and in the corner - icons and a lectern with books. There was no bed in the cell since Vladika did not lie down to sleep, but prayed by leaning on a tall stick with a cross-bar on top. Sometimes he prayed on his knees; most likely when he prostrated himself he would then fall asleep for a little while in that position on the floor. That is how he exhausted himself! Sometimes during our conversation it seemed to me that he dozed. But when I stopped, he would immediately say: "Continue, I hear you.'" "Since for a long time our church did not have a permanent priest, once a priest from another parish came to us to celebrate Vespers. The whole service lasted only 45 minutes (usually it takes 2 and a half hours)! We were horrified! So many parts of Vespers were skipped that we decided to tell about this to Vladika. We hopped that he will influence the priest to follow the established order of Orthodox services. But Vladika pleasantly smiling said to us: `How difficult is to please you people. I celebrate too long and he too short!' With such kindness and meekness he taught us not to judge." Vladika's reputation for holiness, too, spread among the non-Orthodox as well as the Orthodox population. In one of the Catholic churches of Paris, a priest strove to inspire his young people with these words: "You demand proofs, you say that now there are neither miracles nor saints. Why should I give you theoretical proofs, when today there walks in the streets of Paris a Saint - Saint Jean Nus Pieds (Saint John the Barefoot)." Many people testify to the miracles worked by the prayers of Archbishop John in Western Europe. V. D. recounts: "Many were aware that it was not necessary to ask Vladika to visit someone. The Lord Himself inspired him where and to whom to go. Vladika John was known to many in the French hospitals and was admitted therein at any time. Besides, Vladika unerringly directed himself where he was needed. My brother, when wounded in the head, was taken to the hospital. The x-ray revealed a large fracture of the skull. His eyes swelled and became sanguinous; he was in critical condition. Vladika, who did not know my brother, somehow found him in the hospital, prayed over him and gave him communion. When my brother underwent a follow up of head x-rays, there was no fracture to be found. My brother recuperated very fast. The doctor was dumbfounded!" During the building of the San Francisco Cathedral. Under Vladika's guidance a measure of peace was restored, the paralysis of the community was ended, and the cathedral finished. Yet even in the role of peacemaker Vladika was attacked, and accusations and slanders were heaped upon his head. He was forced to appear in public court - in flagrant violation of church canons - to answer to preposterous charges of concealing financial dishonesty by the Parish Council. All involved were completely exonerated; but thus Vladika's last years were filled with the bitterness of slander and persecution, to which he unfailingly replied without complaint, without judging anyone, with undisturbed peacefulness. At the end of October the Roman Catholic Church celebrates the feast of All Saints. There is a tradition that during the preceding night the dark spirits celebrated their own festival of disorder. In America this "celebration" called Halloween has become an occasion on which children make mischief dressed in costumes of witches, devils, ghosts, as if calling on the dark powers - a diabolic mockery of Christianity. A group of Russians organized on this night a Halloween Ball. In the San Francisco Cathedral at this time was the All-night Vigil celebrated, and a number of people were absent, to the great sorrow of Vladika. After the service Vladika went to the place where the ball was still in progress. He climbed the steps and entered the hall, to the absolute astonishment of the participants. The music stopped and Vladika, in complete silence, glared at the dumbfounded people, slowly and deliberately making the round of the entire hall, staff in hand. He spoke not a word, and none was necessary; the mere sight of Vladika stung the conscience of all, as was evident from the general consternation. Vladika left in silence; and the next day in church he thundered his holy indignation and his flaming zeal calling all to the devout Christian life. Yet Vladika is not best remembered by his flock for his sternness, but rather for his gentleness, his joyfulness, even for what is known as "foolishness for Christ's sake." The most popular photograph of him captures something of this aspect of his character. It was especially noticeable in his conduct with children. After services he would smile and joke with the boys who served with him, playfully knocking the refractory on the head with his staff. Occasionally the Cathedral clergy would be disconcerted to see Vladika, in the middle of a service (though never in the altar), bend over to play with a small child! And on feast days when blessing with holy water was called for, he would sprinkle the faithful, not on the top of the head as is usual, but right in the face (which once led a small girl to exclaim, "he squirts you"), with a noticeable glint in his eye and total unconcern at the discomfiture of some of the more dignified. Children were absolutely devoted to him, despite his usual strictness with them. Anna S. recollects: "My sister Musia and I got into an accident. A drunken young man was traveling towards us. He struck with great force the door on the side where my sister was sitting. The ambulance was called and she was taken to the hospital. Her condition was very serious - a lung was punctured and a rib broken, which caused her great pain. Her eyes were invisible in her swollen face. When Vladika visited her, she lifted her eyelid with her finger and upon seeing him took his hand and kissed it. She could not speak since she had a tracheotomy, but tears of joy flowed from her eyes. After that Vladika visited her several times and she began to get better. Once Vladika entered the ward and announced: `Musia is feeling very poorly now.' He then went to her and, closing the drape around her bed, he prayed for a long time. During his prayer we were approached by two physicians and I asked them how serious was my sister's condition and if I should summon her daughter from Canada? (we kept from the daughter the fact that her mother was in an accident). The physicians answered: `To call or not to call the family is your problem - we cannot guarantee that she will survive until the morning.' Thank God that she not only survived that night, but was completely cured and returned to Canada ... My family and I believe that Musia was saved by the prayers of Vladika John." Vladika's life was governed by the standards of the spiritual life, and if this upset the routine order of things it was in order to jolt people out of their spiritual inertia and remind them that there is a higher judgment than the world's. 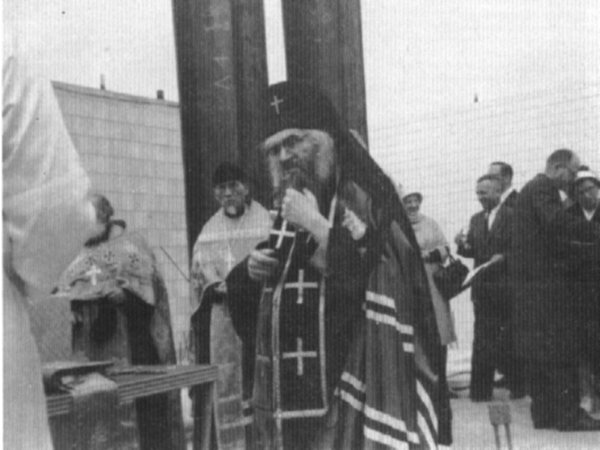 A remarkable incident from Vladika's years in San Francisco (1963) illustrates several aspects of his holiness: his spiritual boldness based on absolute faith; his ability to see the future and to overcome by his spiritual sight the bounds of space; and the power of his prayer, which beyond all doubt worked miracles. The incident is related by the woman who witnessed it, Mrs. L. Liu; the exact words of Vladika were confirmed by the Mr. T. who is mentioned. "In San Francisco my husband was involved in an automobile accident and was seriously injured; he lost control of balance and suffered terribly. At this time Vladika had many troubles. Knowing the power of Vladika's prayers, I thought: "If I ask Vladika to come to my husband, my husband would recover;" But I was afraid to do this because Vladika was so busy then. Two days passed, and suddenly Vladika came to us, accompanied by Mr. B. T., who had driven him. Vladika stayed with us about five minutes, but I believed that my husband would recover. The state of his health was at its most serious point then, and after Vladika's visit there was a sharp crisis and then he began to recover and lived four more years after this. He was quite aged. Afterwards I met Mr. T. at a Church meeting and he told me that he had been driving Vladika to the airport. Suddenly Vladika had said to him: "Let's go now to the Liu's." He had objected that they would be late for the plane and that he could not turn around at that moment. Then Vladika had said: "Can you take the life of a man upon yourself?" He could do nothing but drive Vladika to us. Vladika, as it turned out, was not late for the plane." St. John Maximovitch lying in state, immediately after his repose. AMONG THOSE WHO KNEW and loved Vladika, the first response to the news of his sudden death was: it cannot be! And this was more than a reaction to the suddenness of the event; for among those who were close to him there had unaccountably developed the notion that this pillar of the Church, this holy man who was always accessible to his flock - would never cease to be! There would never be a time when one would not be able to turn to him for advice and consolation! In one sense, in a spiritual sense, this has since turned out to be true. But it is also one of the realities of this world that every man who lives must die. Vladika was prepared for this reality. To the manager of the orphanage where he lived, who had spoken in the spring of 1966 of a diocesan meeting to be held three years later, he indicated, "I will not be here then." In May, 1966, a woman who had known Vladika for twelve years and whose testimony, according to Metropolitan Philaret, is "worthy of complete confidence" was amazed to hear him say, "I will die soon, at the end of June - not in San Francisco, but in Seattle." Again, on the evening before his departure for Seattle, four days before his death, Vladika astonished a man for whom he had just served a moleben with the words, "You will not kiss my hand again." And on the day of his death, at the conclusion of the Divine Liturgy which he celebrated, he spent three hours in the altar praying, emerging not long before his death, which occurred on July 2, 1966. He died in his room in the parish building next to the church. He was heard to fall and, having been placed in a chair by those who ran to help him, breathed his last peacefully and with little evident pain, in the presence of the miracle-working Kursk Icon of the Sign. Before the of canonization of Archbishop John his relics reposed in a chapel in the basement of the San Francisco cathedral (after the canonization in July of 1994 the relics of Archbishop John were moved to the main floor of the cathedral). Soon after his repose, a new chapter began in the story of this holy man. Just as St. Seraphim of Sarov told his spiritual children to regard him as living after his death, and to come to his grave and tell him what was in their hearts, so our Vladika also has proved to be hearing those who revere his memory. Soon after his death a one-time student of his, Fr. Amvrosy P., saw one night a dream or a vision: Vladika, clad in Easter vestments, full of light and shining, was censing the cathedral and joyfully uttered to him just one word while blessing him: "happy." Later, before the end of the forty-day period, Fr. Constantine Z., long Vladika' s deacon and now a priest, who had lately been angry at Vladika and had begun to doubt his righteousness, saw Vladika in a dream all in light, with rays of light shining around his head so brightly that it was impossible to look at them. Thus were Fr. Constantine's doubts of Vladika's holiness dispelled. The manager of the St. Tikhon Zadonsky Home and long a devoted servant of Vladika, M. A. Shakmatova, saw a remarkable dream. A crowd of people carried Vladika in a coffin into St. Tikhon's Church; Vladika came to life and stood in the royal doors anointing the people and saying to her, "Tell the people: although I have died, I am alive!" As during his life time, Vladika continues to be very active in helping those who need him. Here are just two of the thousands of cases of Vladika's miracles. Victor Boyton, who witnessed the healing of his friend by Vladika John, recounts: "The miracle occurred after I had received the copyright to the English publication of Orthodox Life from Jordanville, N.Y., which included photos of Vladika John. I had a friend, a Moslem from Russia, who was suffering from cancer of the blood and was losing his sight. The doctors concurred that in three months time he would be blind. Placing the picture of Vladika John by my vigil light, I began to pray daily for my friend. After a short period of time my friend was healed from the blood cancer and began to see normally. The eye doctors were amazed at this occurrence. From then on, my friend has lead a normal life and reads without impediment." 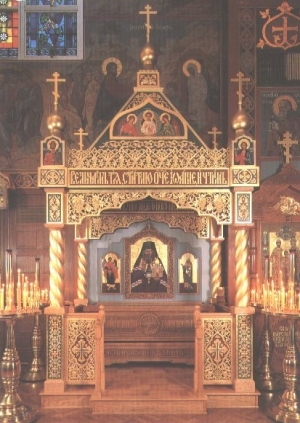 St. John Maximovitch reliquary, located at the Cathedral in San Fransisco. THE BLESSED ARCHBISHOP JOHN of Shanghai and San Francisco was canonized as a Saint by the Russian Church on July 2 1994. It was a wonderful and unforgettable event to which hundreds of clergy and many thousands of laymen came from all over the world! The importance of St. John for the people of the 20th Century cannot be underestimated. Those who knew him personally or have read about his life and miracles have learned of the tremendous spiritual power embodied in this frail little man. God was drawn to the burning, loving heart of Vladika John, which became a vessel of His grace. He entrusted the Saint with heavenly secrets and the ability to transcend physical laws, making him a point of contact between Himself, the Creator, and us, His creatures. There can be no doubt that Vladika John has been sent by God as a gift of holiness to the people of the last days. At a time when imitation has become the norm in all aspects of life, when the authentic spirit of the Christian Faith has been so hidden that most are oblivious of its very existence, he can be seen as a model of genuineness. Vladika John has set the right "tone" of true apostleship in the modern world. As more people are drawn into the Orthodox Church of Christ before the final unleashing of evil, may they look to him as their loving guide and a pastor who knows no death. He is a kind of "measuring stick" that indicates who and what is real in our confusing times. The unit of measure is nothing else than pure Christian love, which he possessed and distributed in abundance. With this love, the intense struggle of spiritual life becomes worth the effort. By the prayers of Saint John may God bless and save us. Amen! Through the prayers of Saint John, may the Lord Jesus Christ have mercy on us. Amen!